As I was doing the last piece, “Tree Top Paradise”, I got to thinking about the other part of the experience of looking at the tree. I started to think of the chair I was sitting in, as a peaceful paradise. Surely, everyone knows what it’s like to have a favorite, welcoming chair. It occurred to me that a good drawing of one, when contemplated, could produce a peaceful feeling. I’ve explored the idea of empty chairs before. The drawing “Louie’s Spot”, is one. Here, though, I was creating a personality portrait of my landlord, by portraying the items surrounding him. It was also meant to give the feeling of a summer day. I tried to do the living room chair once before, too, but was unhappy with the results. 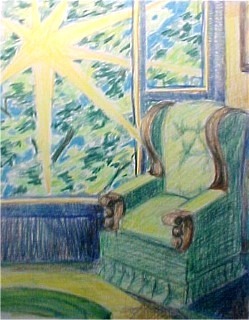 I didn’t pay enough attention to the drawing of the chair, the idea was to focus on the window. My next piece will focus more on the chair. 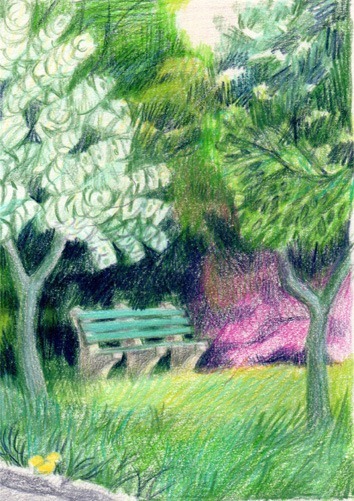 Along this same theme, although unintentionally putting a place to sit in a paradise is “Refuge”, from a long time ago. So, I will be exploring the theme once again, but more carefully.